BOB ABERNETHY, correspondent: John Unger is a 45-year-old West Virginia native who has pastored St. John Lutheran Church in Harper’s Ferry for four-and-a-half years. He says when he started the congregation consisted of six people and a dog. Today, about fifty people worship here on the average Sunday. They love their pastor, so much that they seem not to mind sharing him with two other churches: the United Methodists and the Episcopalians. ABERNETHY: Such interaction used to be unthinkable. 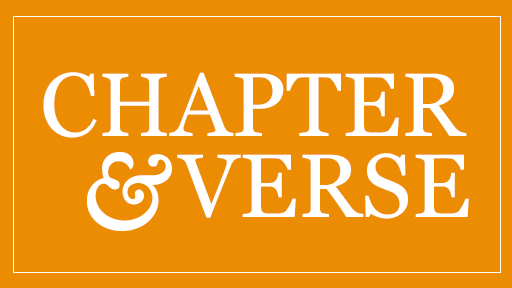 But 13 years ago, the national Evangelical Lutherans and Episcopalians agreed to honor and accept each other's clergy. John had been filling in at the Episcopal church informally, while the number of parishioners grew from five to about 30. Then last August, still the pastor of St. John Lutheran, Unger was formally installed as the priest of St. John’s Episcopal Church by the area’s Episcopal bishop. ABERNETHY: Unger thinks he is the first person in the country to be pastor, simultaneously, of churches of three different denominations. UNGER: I’ll tell you that I can’t do it, not alone. I recognize my limitations. But I believe that with God all things are possible. ABERNETHY: It also can’t hurt that John relates so warmly to his people. UNGER (to parishioners exiting the church): I love you, too. I’ve been praying for you. See you later. See you next Sunday. ABERNETHY: When the 8 am Episcopal service is over, John walks a block to his Lutheran church to lead the 9:30 service there. John talks his sermons, which are slightly different at each church. Cara Unger, John’s wife, is a school teacher who also teaches at the Sunday school here. Unger thinks the interaction between his three churches can be a model for what could be done around the country: individual congregations working together but still keeping each one’s distinctive traditions. He also thinks the example here would be great for national politics. UNGER: If these three denominations can sit down and have Bible study and dialogue and communion and still go back to their respective positions and doctrines and traditions, surely we ought to be able to do the same thing in our political realm. You are not going to be any less a Republican or a Democrat if you two start talking. ABERNETHY: When Unger talks politics he is on familiar ground. He is not only the pastor of three churches he is also a state senator, indeed, a Democrat who has been the majority leader of the West Virginia Senate. I asked him about crossing the line between church and state. 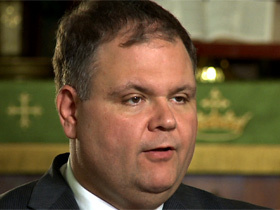 UNGER: I am very careful to make sure that I don’t bring politics into the church. However, I’ll tell you this, that I do bring my faith into my politics. It is who I am. And I do not discredit or try to in any way tear down other people’s point of view. I believe my ministry is loving God with all my heart, mind, soul, and strength, and my public service is loving my neighbor as myself. Being a pastor has made me a better legislator, because I get to go into people’s homes at their most vulnerable time and understand the human condition, seeing where people live, and as an elected official I never got that opportunity. But as a pastor they invite me in. ABERNETHY: Last January, when a chemical leak poisoned the city of Charleston’s water, Unger led the campaign for a law to protect the whole state’s water supply. It passed unanimously. Unger thinks one reason was his pastoral approach to lobbyists and his fellow-lawmakers. UNGER: Whatever their faith is, we may disagree on the policy, but I do know that I respect you as a child of God, and therefore I need to respect you as such. It allows for better discourse, therefore allows for better policy. ABERNETHY: Unger thinks the Congress in Washington needs a big dose of the same mutual respect. UNGER: You know, the biggest problem with Congress is that there is no dialogue and no respect with one another. I mean, they are shouting at each other, they are calling each other names, and they are tearing each other down. Therefore nothing is getting done. ABERNETHY: Unger has had a busy life. After graduation from West Virginia University he was a Rhodes Scholar at Oxford. He spent a year with Mother Teresa in India. He was a missionary in Hong Kong. He helped boat people fleeing Vietnam and Kurdish refugees in Iraq. I asked John’s wife, what it’s like being married to a man who has done and is doing so much. CARA UNGER: Interesting. It’s interesting. It can be frustrating that he is gone. It can be difficult. But I always try to keep in mind, too, how important the work is that he is doing. ABERNETHY: At their 11:15 service, United Methodists at Unger’s third church had seen their numbers drop to 11 before they asked him to become their pastor, too, a year ago. Now, most Sundays, the number of Methodist worshippers is over 40, and on this day the church was full with members from many decades celebrating its 165th birthday. Even though he had just finished leading three services at three churches, Unger seemed far from exhausted. UNGER (speaking to congregation): Love the Lord and serve others for the glory of God. Thanks be to God. UNGER: Now you all can do better than that. ABERNETHY: One reason for Pastor Unger’s confidence is his conviction that he is doing God’s will. Another may be his and his wife’s ability to have some fun along the way. Currently serving as the pastor of three small West Virginia churches affiliated with three different Mainline Protestant denominations, John Unger believes he may be the first minister to hold such a position. 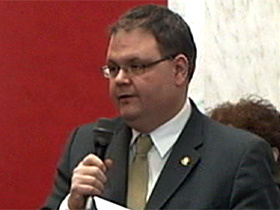 He is also a politician, serving as a senator in the West Virginia legislature.